Unmarried men in Manhattan faced a problem when it came to finding housing in the late 19th Century. Bachelors were not generally welcomed by most boarding houses and respectable apartment houses. Yet the number of unmarried men in the city skyrocketed between 1870 to 1890, when about 45 percent of the male population was single. In 1898 another niche was filled – a bachelor apartment building for unmarried men of means. Designed by Rossiter & Wright, the Royalton Hotel rose at 44 West 44th Street, smack in the middle of the gentlemen’s club district, making it extremely convenient to well-heeled bachelors. The red brick Regency-inspired hotel sat atop a two-story limestone base dominated by a massive pedimented entranceway supported by two Ionic pillars. For the convenience of the tenants, entry could be made from either 43rd or 44th Streets. Although construction was not without problems – several general strikes were ordered when, for instance, the Housesmith’s Union complained that work being done by the Metal Wire Lathers’ Union belonged to them – the house opened for business in 1897. Moore attempted to force the gate open as the elevator descended, crushing his body and killing him. 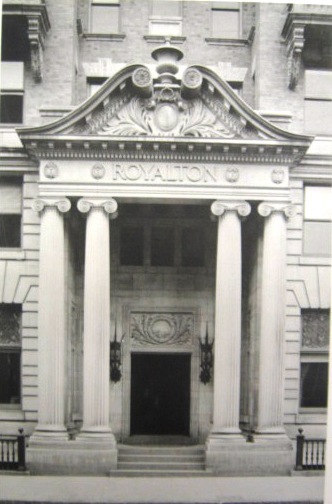 Although it was, as The New York Times referred to it “a bachelor apartment house,” the Royalton boasted a first-class dining room and restaurant on the first floor which attracted the cream of New York society. On January 23, 1900, having been to the Lyceum Theatre, The Count and Countess de Castellane were the guests of Edmund Randolph “at a little supper” along with Mr. and Mrs. George J. Gould and Mr. and Mrs. Sidney Smith. A reception for the US Ambassador to the German Empire was given by the Cornell University Club in their clubrooms here in 1901 and the same year the New York Yacht Club hosted a series of lectures on ship designing. Among the wealthy residents were James Amm, an oil operator and refiner who died leaving a $6.75 million estate, and Frederick Kursheedt, president of Kursheedt Manufacturing Co. 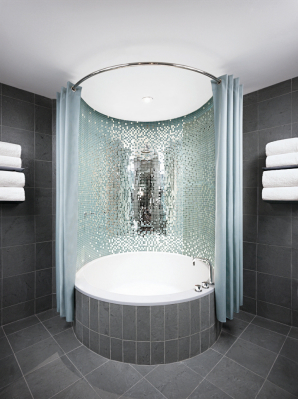 In time the need for bachelor hotels waned and the Royalton welcomed tenants of both sexes. 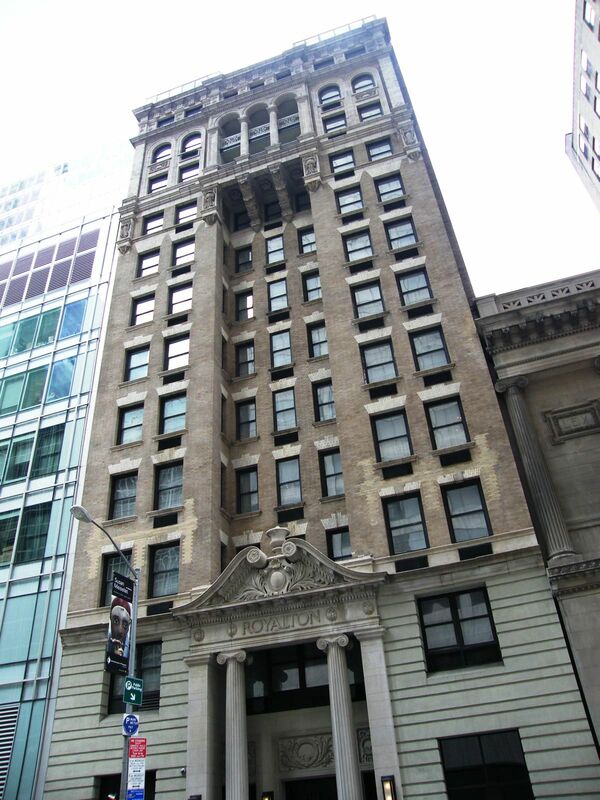 Its proximity to Broadway filled the apartments with theatre figures. Actresses and actors like Ruth Gates, Katharine Witchie Riggs, Alexander Granach, and Lucy Beaumont lived here. Drama critics Lawrence Reamer, who wrote for The Sun, and George Jean Nathan, the “dean of Broadway drama critics,” had apartments in the Royalton as did humorist Robert Benchly. Ben Haas, who wrote over 100 novels, died in his room in 1977. 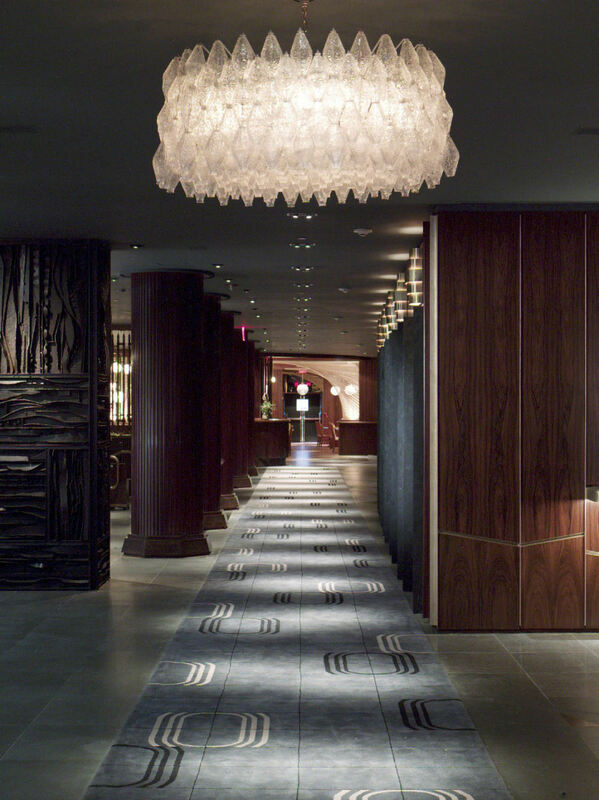 Although the hotel’s restaurant, 44, and the trendy lobby became a fashionable meeting place for journalists and celebrities, it would all be changed again in 2007. Philippe Starck did not agree. “I think if you are lucky enough to own an icon, you shouldn’t kill the icon,” he told The New York Times. The hotel today is far from “average.” The rubbernecking at the Royalton Hotel is no longer directed at the exterior, but at the extraordinary interiors.